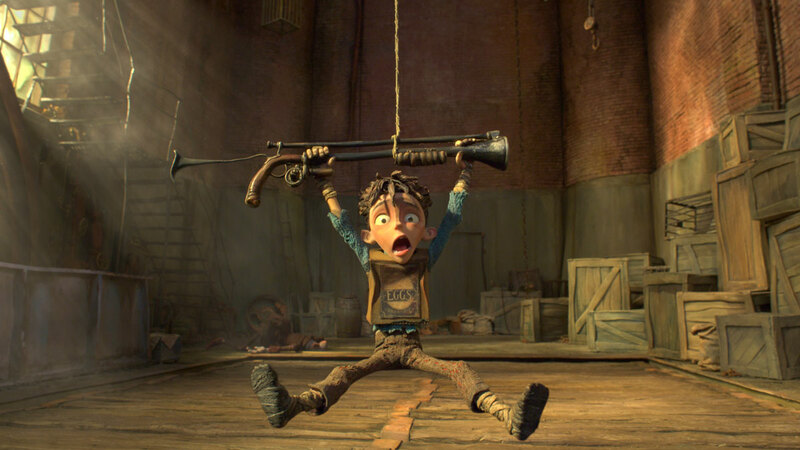 Following up on the success of its ultra-clever stop-motion features Coraline and ParaNorman, Laika Studios, an animation outpost proudly ensconced far from Hollywood (in Hillsboro, OR), presents The Boxtrolls, a sublime Victorian-era fantasy focusing on the travails and misadventures of subterranean scavengers. By Kevin H. Martin. The film’s “heroes” wear cardboard boxes that function as their cover when venturing topside, and the trolls are seen (quite wrong-headedly) as both semimythical and extremely dangerous by the English villagers above ground. Demonstrating as much of a sense of family as the humans who fear them (and happily lacking human class distinctions), the trolls adopt a young abandoned boy (voiced by Isaac Hempstead Wright) named “Eggs,” after the label on his crate disguise. This act of troll kindness pays unexpected dividends later on in the tale, when the evil pest exterminator, Archibald Snatcher (Sir Ben Kingsley), attempts to destroy the entire boxtroll nation. For producer and lead animator Travis Knight, the company’s long history with dimensional animation (Laika began as Will Vinton Studios) is a tradition to be respected, but also augmented by technical advances. 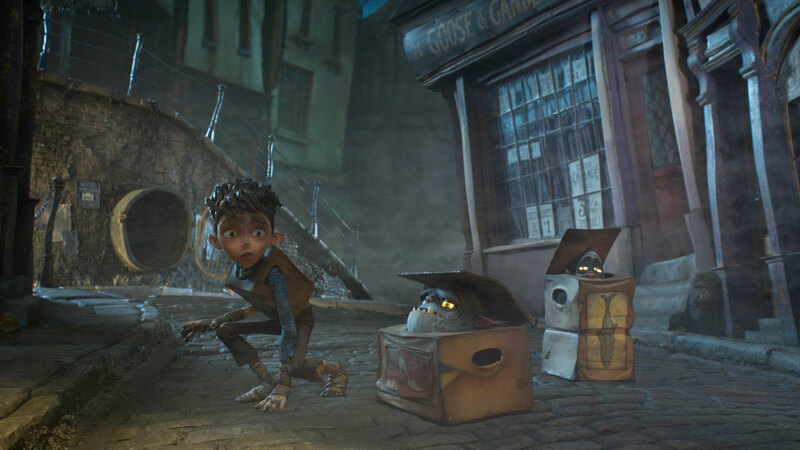 Co-directors Anthony Stacchi and Graham Annable cite the exacting skillsets of the core team members, most of whom have been with Laika through many projects. That’s why Creative Supervisor of Puppet Fabrication Georgina Hayns saw to countless technical and artistic details involved in fashioning the characters, ranging from incorporation of electronics into the troll heads for their glowing eyes to the employment of laser cutting for scaled-down costuming details. Likewise for Costume Designer Deborah Cook, who relied upon an embroidery sewing machine to weave together Eggs’ sweater of many subtle colorations and exploited leather gloves as needed to create shoes and other character accoutrements. 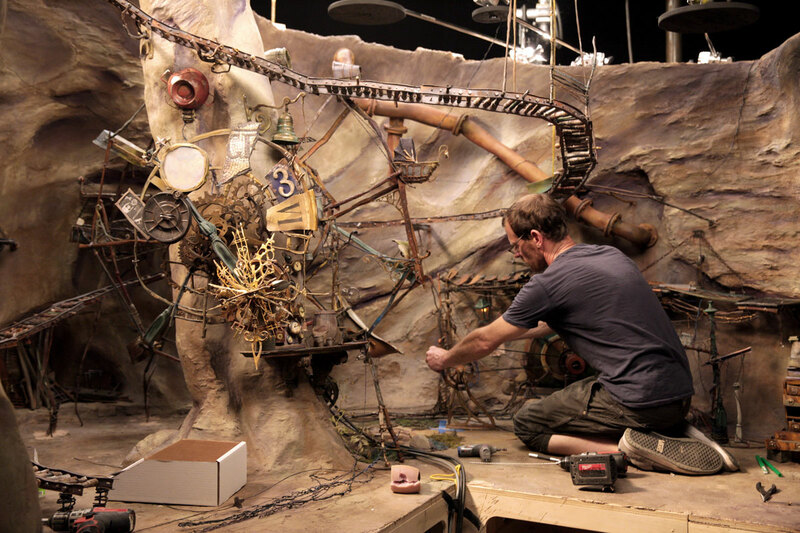 Laika’s thirst for innovation reached new heights on The Boxtrolls via the new arena of 3D printing. Director of Rapid Prototyping Brian McLean’s team used 3D printing to translate creature designs into a virtual (and physical) flipbook of expressions for the visage of every character. 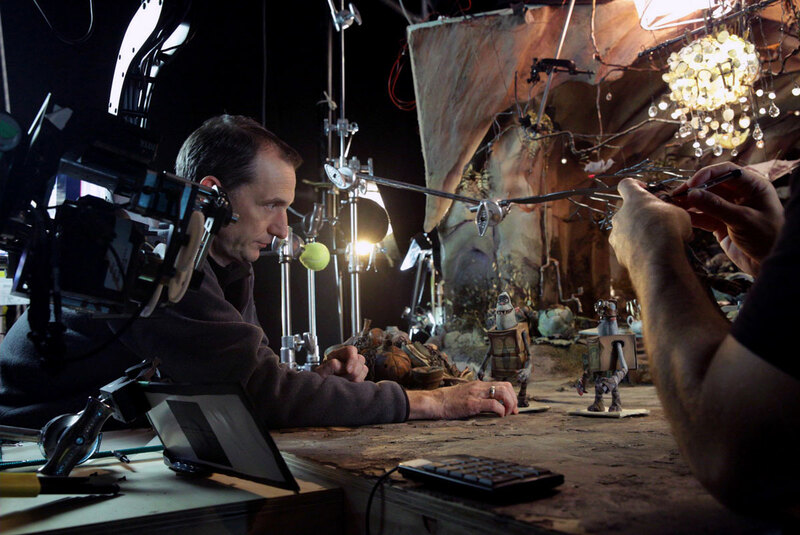 Steve Emerson and Brian Van’t Hul served as VFX supervisors, overseeing CGI elements for The Boxtrolls. 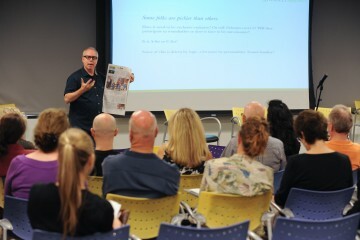 “We’re always trying to gauge and allocate resources most efficiently,” Emerson relates, “and that means getting all the department heads together in a room to figure out what gets built practically and what will be a digital extension. More than fifty Canon EOS 5D Mark III (22.3-megapixel, full-frame) cameras were utilized on Laika’s many stages, while the company’s CG division shot reference and plate footage with Sony HD and RED cameras. Dragonframe image-capture software (A Boy and His Dog, ICG October 2012) interfaced with DMX lighting and regulated shutter speed, aperture and other functions on the Canon DSLR cameras, while Dragon’s IOTA system controlled the stereo slide for separate left-eye/right-eye capture. Kuper motion-control systems saw frequent action for the show’s many moving camera shots, which delivered epic sweeping moves as well as more subtle activity that emphasized character moments. 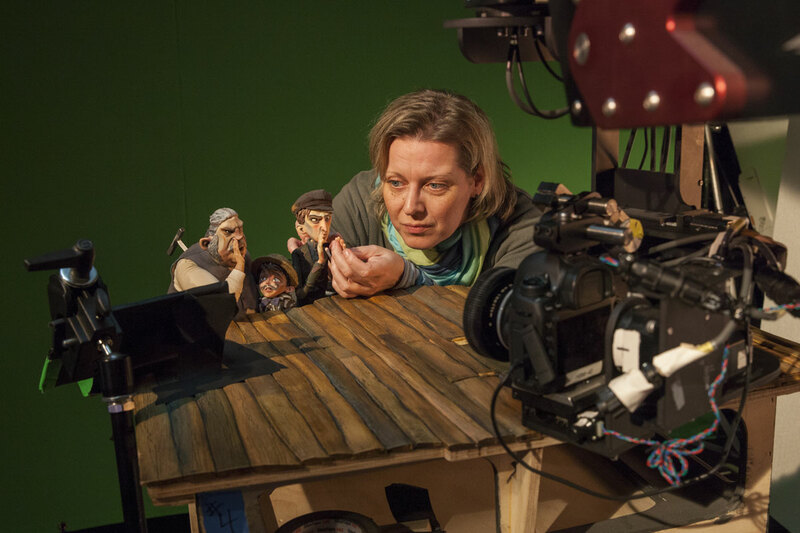 Cinematographer John Ashlee Prat, who began his career in stop-motion as a claymation animator working on those memorable 1980s icons The California Raisins, embraces Laika’s mix of in-camera and CG elements. In addition to Prat, four cinematographers (credited as “lighting cameramen”) captured many of the film’s setups. Mark Stewart and Chris Peterson were Laika veterans, while Local 600 members Pat Sweeney and Eric Adkins also brought in years of experience, shooting unreal-time setups with and without motion control. 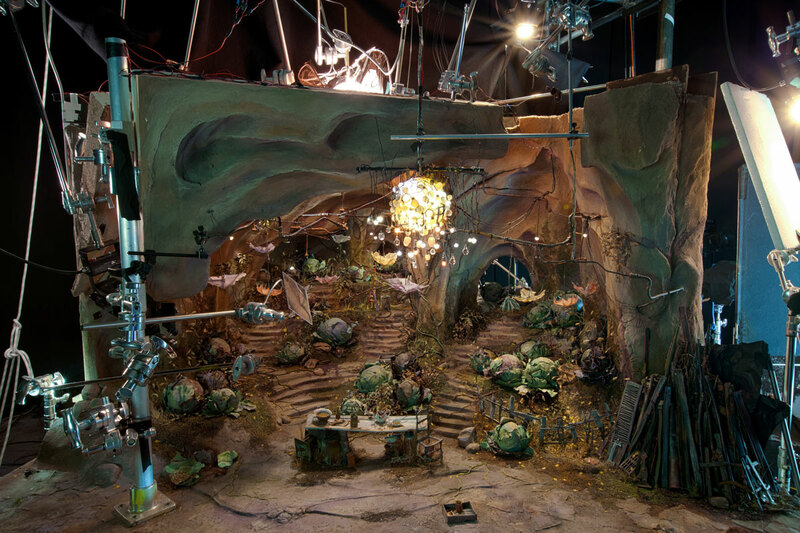 Sweeney, whose years at ILM involved shooting starships against blue screen and submarines in smoked faux-water settings, was a camera operator on the Selick/Burton stop-motion feature The Nightmare Before Christmas. He recalls how the size of the camera on that project impacted his approach. Each lighting cameraman tackled four to six sequences, which, when possible, would be consecutive to maintain continuity. Stewart had the lion’s share of Market Square shots, while Adkins drew most of the underground sets, including a 700-frame reveal of the cavern inhabited by the titular characters. Weeks of work went into lighting the cavern reveal, which then took more than a month of stage time to animate and shoot. “The cavern walls were eight feet tall,” Adkins recounts. 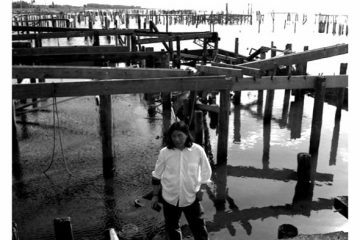 “In a real set, I might not have had space to put light in an ideal location, so that was a consideration I kept in mind. 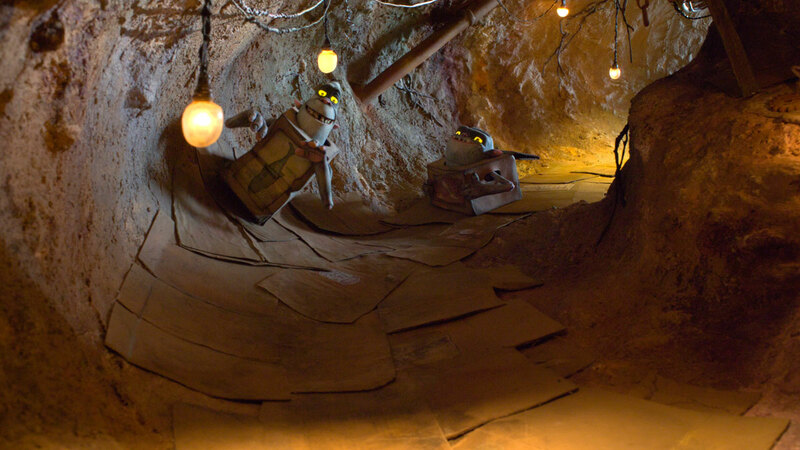 Using different kinds of sources and colors of light also helped emphasize the depth and size of the cavern these creatures call home.” Adkins’ entry onto the show came with the film’s longest single take, an early shot that runs fifty-five seconds and encompasses nearly all of a large three-walled street set. Finessing of the shot’s final details was not fully accomplished until halfway through rehearsal; capturing via motion control enabled the shot to be assembled out of multiple repeat passes. 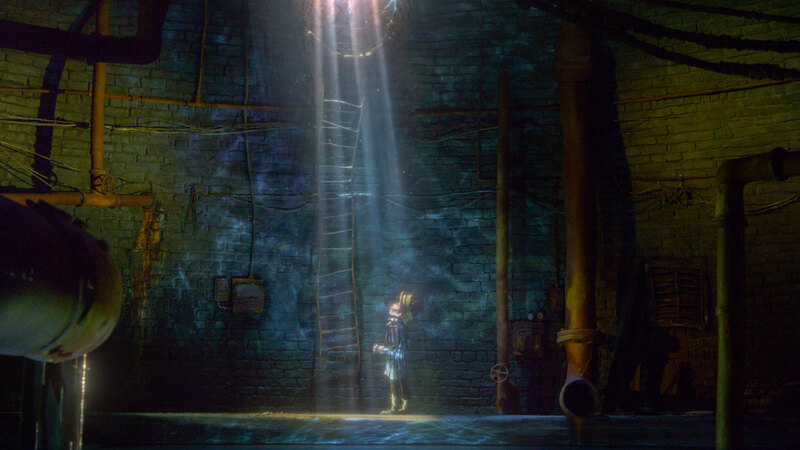 “A background character might be on a part of the stage that was so out of the way that it would be easier for the animator to access him on a separate pass,” Adkins continues. As an additional aid to VFX character replication, production often shot additional blank passes with and without the key light, which provided a better idea about the ambient light levels in any given environment. Increasing the stereoscopic depth was another option for emphasizing the principal characters. Such an approach was meant to emphasize the huge menace of Snatcher’s Mecha-Drill, which recalled ILM’s steampunk-era Imperial Walker as seen in 1998’s Wild Wild West feature. The drill was of immense size for a stop-motion construct, and it featured flame-powered innards that were represented on set via an iPad placed within the behemoth’s body, playing back CG flames. Canon 5D RAW files underwent conversion to EXR format in order to maximize options for image manipulation via linear sensor data. From editorial, files were routed to DI facility FotoKem (Burbank, CA) via their globalDATA FTP, with final grading accomplished there on Mistika by colorist John Daro.